Announcing the DZone Guide to Cloud Development - 2015 Edition! Cloud technologies are nothing new to the software development world—but increasingly, teams are discovering the value of cloud development environments. Our goal here at DZone is to help our community share their skills. 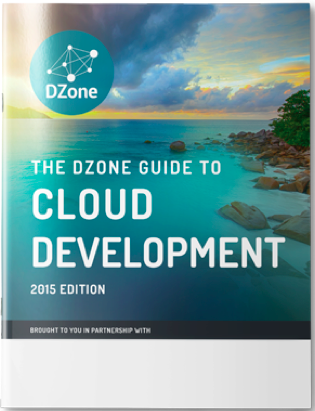 You’ve asked for it, and we’re proud to announce the DZone Guide to Cloud Development - 2015 Edition! We've learned a lot since last year's Cloud Development guide. We hope to show how the cloud has changed over the last year, and forecast where it's going. Our Guide to Cloud Development, launching next Monday, is an essential resource for any developer. In this guide, we’ll offer resources on what how to develop for the cloud, the cloud services landscape, rules for your hybrid cloud architectures, and we'll forecast the next year in cloud. The 2015 edition of the Guide to Cloud Development is our second second edition (the Guide to Continuous Delivery was our first), so we’re starting to see the inklings of some maybe-new trends in cloud adoption by software developers. A directory of the best solutions for PaaS, iPaaS, IaaS, and MBaaS. Articles from topic experts and industry luminaries. Security questions to ask your cloud provider. A visual classification of cloud service providers by layer and use. Analysis of patterns and usage based on research collected from 600+ IT professionals.